Take about 50 ml of the water and heat it until it’s lukewarm. Place the yeast in a 500 ml pot. Add the salt and the sugar, stir well. Leave the mixture in a warm place for about 5 minutes constantly checking on it. When the yeast has risen to the top of the pot it’s ready and you can pour it in a large bowl where you have already put the flour. Add the remaining water and start kneading. At first the dough should be sticky, so add 3-4 tbsp of oil. Knead some more. If it’s still sticky add another 1-2 tbsp of oil. The dough is ready when it is really soft but not sticky, you make it perfect by adding more flour (if it’s really sticky) or more water (if it’s hard). When it’s ready let it sit in the bowl for about an hour. After it rises to twice its size knead it some more and then make 6 loaves. 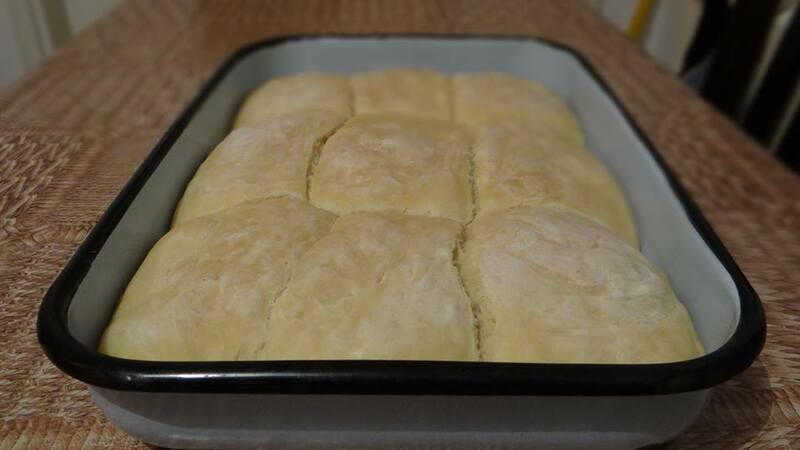 Put the loaves on a greased 15 x 11 inch rectangular pan and let them sit for another 40 minutes. Preheat the oven to 200ºC. After the loaves rise to twice their size put the pan in the oven and bake for about 40 minutes or until the bread turns slightly golden. The bread is ready when wooden toothpick inserted into the center comes out clean. When the bread is done put it on a cooling rack. If you want it really soft and without a crust gently sprinkle it with water and cover it with a clean paper towel. Place a clean cotton towel on top of the paper towel and leave it for about 20 minutes. However, if you adore the crust like I do just leave the bread in the open and let it work its magic. The bread in this picture is made out of rectangular loaves but you can really shape it to your liking. This is the perfect dough for a wonderful crisp French baguette. You can cut it to little pieces and rub it with some garlic while it’s still fresh out the oven and scorching hot, splash on some black olive spread, and top off with a pinch of nutritional yeast. The perfect canapés if you ask me. I think they deserve a recipe of their own, don’t you? As I already said in my post from yesterday, 6 January is Christmas Eve to Orthodox Christians when the whole family gathers and it’s all about this bread actually. We have this tradition to hide a coin in the bread before baking it. When all of the dishes are ready, everyone sits around the table, grace is said, and the oldest family member divides the bread starting with the oldest person. It is believed that the family member that is going to find the coin in their piece of bread is going to have very good luck in the year that’s just begun. Everyone congratulate the person for finding the coin and wish them good health, love, and prosperity. After the toast everyone can start eating. Even though I said that this was completely vegan dinner, yesterday I found out I was wrong. My family has been vegetarian for a couple of years now and I’ve forgotten that my mom used to prepare fish for this dinner back in the days when most of them still ate meat. January 6 is in fact the last day of the Christmas Lent and fish is allowed during fast. So, this dinner turns out to be (almost) vegan throughout the Christian community. In my family it has been completely vegan for some years now.